OpenDNS just released a new service that will automatically update your IP with them as well as DynDNS and others. That would be a great help for me. Does anyone know if this will work with DD-WRT as it is or would there need to be an update? If so, what is the setup? If an update is required would that be possible? I am currently running DD-WRT v24 RC-5 I would appreciate your help. Use can use this config file with inadyn, and your dns-o-matic account details. Just create a startup script and/or cron job for dd-wrt. i am a relatively novice user . . . could you give me a little more details on how to do that? There are other ways to do it, but this is probably the easiest. should ddns be disabled under Setup-DDNS? I think you could probably disable it. Give it a try. The dyndns setup in dd-wrt actually supports a custom configuration. I'll try that when I get home from work. The startup command with ddns disabled did not seem to work for me. i was making the changes remotely and I am no longer able to login as usual using my dyndns address and dns-o-matic has not yet showed any updates. Have you gotten this to work? or are you just being very helpful? Mon Dec 3 13:42:16 2007: INADYN: Started 'INADYN Advanced version 0.1.4' - dynamic DNS updater. Mon Dec 3 13:42:17 2007: I:INADYN: Alias 'hostname.dyndns.org' to IP '123.123.123.123' updated successfully. None of the above will work with DD-WRT until they update the inadyn client to support SSL (the --secure flag), which OpenDNS requires on updates. You're right Rick! My IP never updated with OpenDNS or DynDNS, even though INADYN said it updated successfully, and then no update required..
OpenDNS requires SSL on updates made directly to OpenDNS. However, DNS-O-Matic accepts either SSL or normal HTTP updates. So, you may update OpenDNS via DNS-O-Matic without SSL on your client if you wish . Note: We'd love the inadyn folks to build in SSL support; we've obviously offered the code we added openly, but no one has taken it. We very much want DNS-O-Matic to be an easy option for DD-WRT. I assumed dns-o-matic would update OpenDNS automatically, but this doesn't appear to be the case. I had to add OpenDNS as a service first. now, i was wondering how can i MANUALLY update the DDNS client from my router's command line? 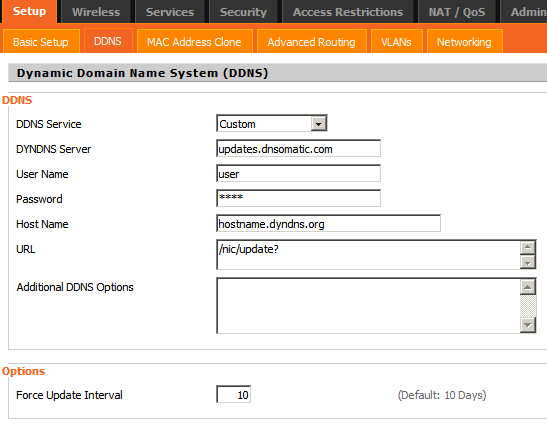 How can I add the wildcard options to dyndns going through the custom option for dns-o-matic updates?